My name is Joe and I have been growing magic mushrooms, off and on, for over 10 years. Magic mushroom is a term used to describe any mushroom that produces a psychedelic effect when ingested. The most common and easiest to grow of all the magic mushrooms is the Psilocybe Cubensis.When I use the term magic mushroom, I am referring specifically to the Psilocybe Cubensis mushroom. Growing Psilocybe Cubensis mushrooms is something that anyone can do. They can be grown indoors or outdoors and growing them doesn’t require a lot of time, space, or expense. Growing Psilocybe Cubensis mushrooms is an easy task, but learning how to grow them can be a lengthy and frustrating endeavor. That is why I have created the most complete and actionable growing guide I have ever seen. I want to pass along all of the knowledge I have acquired over the years to help minimize your failures and maximize your success. When I first became interested in growing magic mushrooms it was difficult to find an easy growing technique to implement. Since I was just beginning and I didn’t have access to a lot of equipment, I wanted a technique that was easy to follow but still produced good results. My first attempt at growing was done by following what is known as the Psilocybe Fanaticus technique, also known as the PF tek.This was supposed to be a good technique, because it was considered to have a low failure rate. When I implemented the PF tek it did produce results but it required a lot of time and work for a small amount of mushrooms. I quickly progressed to what is considered a more advanced growing technique referred to as a casing technique. While I could clearly see the benefits of using the casing technique it took me one year of failed attempts before I could successfully grow Psilocybe Cubensis mushrooms, using this technique. Eventually, I mastered the casing process and it is still the basis of my technique. When done properly, I have found that a good casing technique is much less work and much more effective than the PF tek. Here is just one of the advantages of my technique over the PF tek. The PF tek requires you to prepare a mixture of brown rice flour and vermiculite for the mushrooms food source. After you prepare the food source you have to load it into ½ pint jars. My technique uses whole birdseed as the food source and you load it into ½ gallon jars. 2, ½ gallon jars of birdseed will give you the same yield as about 20, ½ pint jars of brown rice flour and vermiculite so for an equivalent yield, the amount of work involved in the preparation and clean up is much less. Over the years I experimented with many different growing variables such as food sources, growing containers, and automation devices for air, lighting, and temperature control. I kept any adjustment that improved the growing process and I eliminated any that didn’t help or was unnecessary. The final result after years of trial and error is my highly refined, easy to follow, and very effective magic mushroom growing technique, the most effective technique that I have ever found. Over the years, I haved made many adjustments which have reduced the amount of work and maximized the results. One notable difference that sets my guide apart from other guides on the market is that I have divided the growing process into two parts. This allows you to concentrate on only one part at a time and you can get started without having to buy everything all at once. Immediately start off with a technique that took me years of experimenting and refining to perfection. Save yourself all of the time and frustration that I went through while learning how to grow magic mushrooms on my own. Learn the exact materials and techniques I use that contaminates hate but magic mushrooms love. Losing batches due to contamination is almost a non-issue when following this guide. Some people consider“casing” techniques to be more difficult for beginners compared to the PF tek. The technique outlined in my guide, is an easier and more effective method than the PF tek.. The great thing about my method is that even though the process is easy to implement, the results are very good. I typically yield between 3 and 5 ounces of dried mushrooms per grow! While the magic mushrooms are growing, the only thing that is visible is an ordinary 14 gallon Rubber maid container. There are no cords, or mechanical devices to make noise or attract attention. All of the materials required to follow my guide can be purchased at retail stores likeTarget or Wal-Mart. This is convenient because if any of the equipment breaks, it is very easy to replace. I will also provide you with links to places you can buy the materials online .The only material that you cannot purchase at a store is the mushroomspore syringe. Those have to be ordered from an online vendor but I will reveal to you the vendors I recommend.One thing I want to mention is that the possession of Psilocybe Cubensis mushroom spores is illegal in California, Idaho, and Georgia. Because of this, many spore vendors will not ship Psilocybe Cubensis spores to those states so it may bedifficult to obtain the necessary spore syringe.However, in the guideI will provide a link to a spore vendor who has a shipping option for those states. Inside of the guide you will receive a link to the member’s area where I host pictures and videos to accompany the guide.A couple of the steps may be some what challenging to fully understand just from reading the text, so I have included videos of me performing those steps. There are also pictures of the required materials, different mushroom growing phases, and the modified growing equipment. This technique can be implemented indoors, outdoors, or a mixture of both. In the guide I state that I prefer using natural elements whenever possible such as light, and fresh air, but this technique will work strictly indoors if desired. "Magic Mushroom Mastery is Awesome! Well worth the $20. Easy to read and simple to assemble, plus the member’s website has additional material. In my opinion MMM is the way to grow magic mushrooms. Give it a shot, you won’t be disappointed. Great job Joe!" 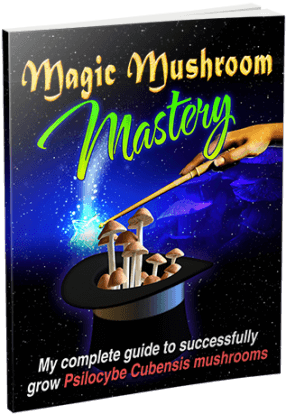 "The Magic Mushroom Mastery guide is simple and to the point. It uses easily acquired materials in an easy and affordable method that produces results. What makes this guide truly invaluable is the support given to you buy the author. The tech is great but with the support and knowledge of someone with years of experience you can’t lose. This was the best 20 bucks I ever spent on a growers guide." "It's the best guide i have seen. Most detailed and straight-forward. 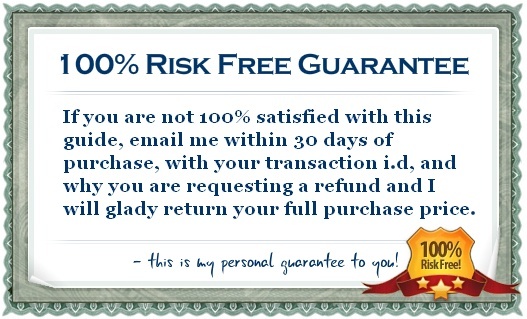 It's also nice the cost-benefit as you said yourself"
When you purchase the guide you will have access to my email address and you can ask me about any questions or concerns you may have regarding growing mushrooms. •An instantly downloadable, 32 page E-book outlining the entire growing process from start to finish. •Detailed information on where to find the necessary materials. •Access to the member’s area where I host the tutorial videos and pictures. • A glossary of commonly used mushroom growing terms. •My email address in case you have any questions or concerns regarding growing mushrooms. I truly believe this is the best guide for anyone who wants to jump on the fast path to learning how to grow magic mushrooms.I’m also highly confident that you will be completely satisfied with this guide. ©2013MagicMushroom Mastery. All rights reserved.